I ask for all the healing and protection of this Sacred Flame Hologram for myself, all of Nature and all life forms in alignment with the Divine Plan for the highest good of all concerned. I ask for the healing and harmony of all of my cells, for the purification and rise in frequency of the food I eat, the water I drink and the air I breathe. Feel the food nourishing your body, the water and air being purified. Ask for the purification of the air, food and water for all life forms. 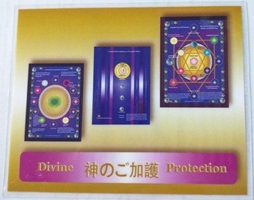 Each of the Living with the Sacred Flame Holograms has been specially activated and a blessing sent with it to each person receiving one. These Holograms work for the highest good of all, in alignment with the Divine Plan. Without the activation, this would only be a piece of paper, however with the activation, the Sacred Flames have a physical channel that allows them to be with us in every aspect of our lives if we choose. 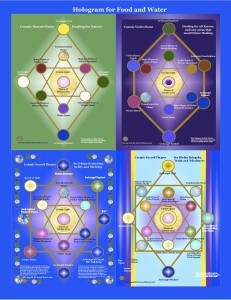 All of the Sacred Flame Holograms carry very, very high frequencies, yet adjust to each person working with them and continue to assist each one in raising their frequencies. Sit with it in meditation and ask that layer after layer of anything that is harmful, useless or non-beneficial be transmuted into the light and that we be filled with Divine Love and all that our I AM Presence wishes us to have or to give us. Meditate with these daily until our whole being is saturated with the Sacred Flames. They continue to grow in power as we use them daily. 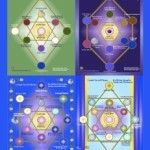 See these energies moving through all of our energies fields and all chakras. See Divine Abundance become a part of all that we are. Have it in the bedroom when you sleep, ask it where it wants to be and before falling asleep ask the Divine Abundance Angels and your guides to continue working on transmuting and healing all beliefs and patterns that are not in harmony with Divine Abundance in all time, space, levels and dimensions, past, present and future. 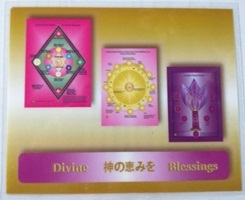 Keep one in your billfold to bless and multiply all abundance in your life. Place checkbooks on this Hologram. Frame it and place it in your home. Visualize this Sacred Flame Hologram moving through your body as a Divine Screen of Light starting at the chakra below your feet, all the way through the 12th chakra and down to the center of the earth, if guided. Feel all of the cells of your bodies being cleansed and purified and brought back into the Divine Abundance of the I AM Presence. You may work with as many Holograms at one time as you are guided. Send these back into past lives and future ones for any healing or assistance that is needed. Call on the Archangels of this Hologram to work with you and fill you with Light. You may notice many different feelings in the various bodies or none at all but it is truly working. You may feel something leaving and then being filled with Light. Clairvoyants have seen the person holding this completely surrounded with Divine Love. They see so much being transmuted into the light from the deep cellular levels. Various sigils are seen, Sacred Names and symbols, the Music of the Spheres and all that these Sacred Flames have. 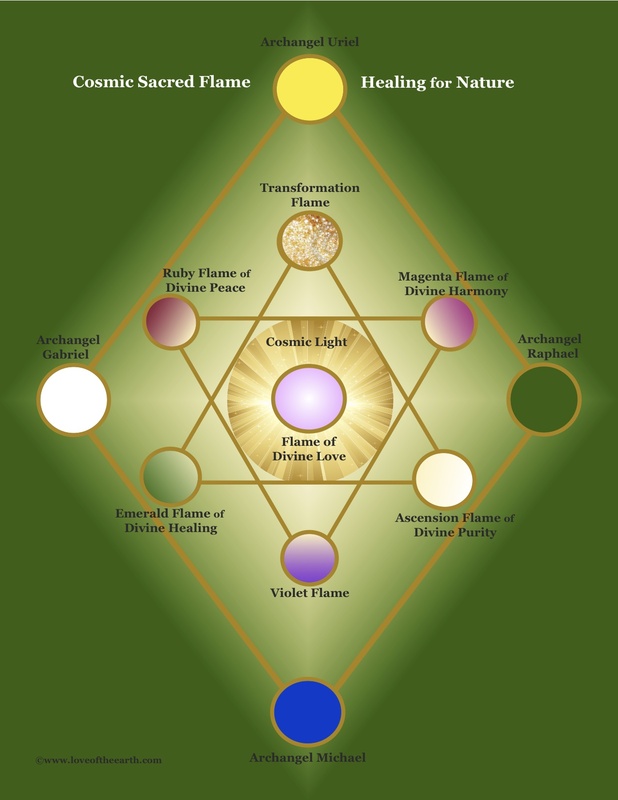 As anything is being dissolved into the light, that area is immediately filled with Divine Love, the Violet Flame and Ascension Flame of Purity or whatever Sacred Flame is needed by that person. This is also most helpful for nature and animals and all life forms. The Sacred Flames are Living Beings of Light. In the Golden Ages, souls came to work with the specific Sacred Flame of that age in order to continue their growth. Each age lasted 2000 years. That is how much there is to learn about each Flame and their tremendous power, wisdom and love and all that each Flame has to offer. What a joy to be able to work with them!